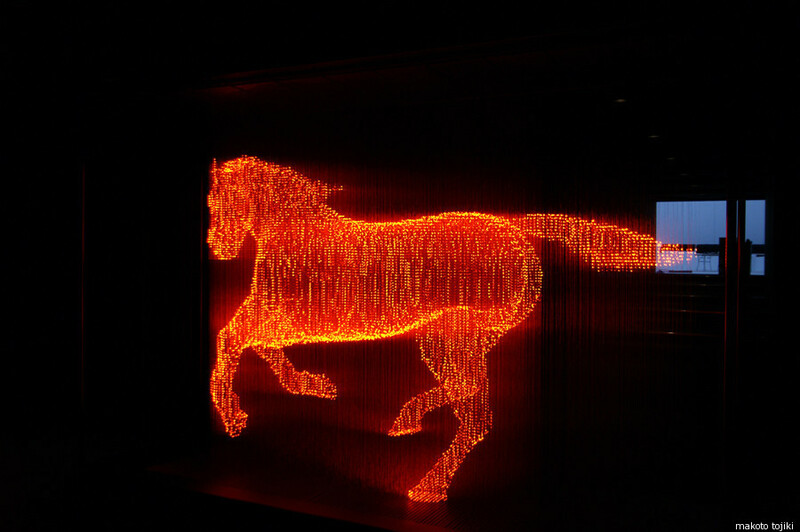 Makoto Tojiki's "No Shadow" sculptures portray glowing humans and animals out of thousands of mesmerizing LED lights. The Japanese artist has always been fascinated by lights, however; after being educated as an industrial design engineer, Tojiki turned his attention toward creating art. Of his work Tojiki said: "An object is seen when our eyes capture light that is reflected from the object. If we extract just the light that is reflected from ‘something,’ are we still in the presence of that 'something?' Using contours of light, I try to express this 'something.'" Makoto Tojiki, The Man with No Shadow, Led, Copper wire, W640 D580 H2010, 2009, Self-production, Memo: It is exhibited to Salone-Satellite Milano of 2009.